How stoked is NECA, you ask yourself, to present this all-new line of figures based on the massively successful Twilight feature film? What kind of question is that? The answer is we’re out of our heads about it and the figures are even better than we with our insanely high standards could have hoped for. 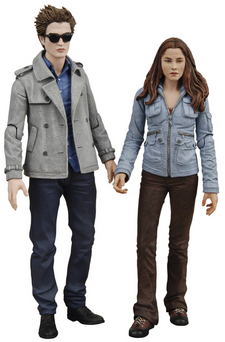 First up and available now is a 2-pack with Edward Cullen and Bella Swan is available now, so make sure you don’t miss your chance to get in on the vampire action! 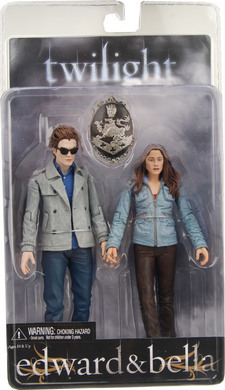 Each of the figures stands between 6.5″ and 7″ tall and Edward has a totally new head sculpt than in the single package, complete with sunglasses. Both Edward and Bella have ball-jointed necks, shoulders and waists along with joints at the elbows, swivel wrists and ankles! And just because we love you and we love Twilight, we’ve thrown in a replica of the Cullen crest. So just you sink your teeth into that. Go forth and enjoy, children of the night.